Picking up soon after the events of the first film, we find Roger and Anita organising the move to their dreamt of Dalmatian Plantation. Everyone is excited, except for little Patch, who feels lost in the sea of Dalmatian spots and wants to feel special. His time soon comes when the moving van leaves without him, and he is unintentionally left lost and on his own in London. Luckily for Patch, Thunderbolt, the action canine TV star from the puppies’ favorite show in the original, is in town to promote his series and the two strike up an unlikely friendship. Let’s get one thing straight. Like many people, I don’t like the Disney company messing with its history, and yet the company that is worried enough to go to court to protect the copyrighted likes of Mickey and the gang seems quite happy to ransack its own vaults to continue releasing direct-to-video “cheapquels” to their movies. As Walt himself said on the request for more Three Little Pigs shorts, “You can’t top pigs with pigs”! But the Disney line of today likes to make us think that these new films allow us to “spend more time with beloved characters and share new and exciting adventures”. As Walt bowed to public pressure (there were four more Pigs cartoons, each of lower degrees of success), the Studio has jumped on this bandwagon too, issuing follow-ups to sequels that no one particularly asked for, but that have turned a tidy profit for the company. None of these films will be remembered for their attention to detail, character arcs, or fantastic artwork, but they do, in a way, hark back to simpler, classic storytelling, without the big budgets and advertising campaigns that can sink a movie before it opens (think Treasure Planet). On video, titles can be issued with or without a massive splash, and either make a nice lump of cash, or end up in the bargain basement shelves without much derision. They’ll all sell one day, and without the embarrassment of huge media attention. Over time, the titles began to grow in scope and animation did improve greatly, but when Disney announced that several titles would first go via theatrical release, I despaired the thinking behind that decision. The Tigger Movie, the first to get upgraded to the big-screen, just about worked, as the Pooh films have a look of their own, and the limited animation techniques suited the production design well. The story, if not the most sophisticated Disney had seen in a while, was perfectly and squarely aimed at its target audience, and it was a moderate hit (leading to its own series of more and more bland follow-ups). Next up was to be a new sequel to one of my favorites, 101 Dalmatians. Back in 1999, this franchise was hot. The original video release had sold extremely well, and the film fared better than expected in a 1991 theatrical re-issue. Its contemporary setting and classic, timeless characters play just as well now as they did back in 1961. The Studio had just made a live-action remake with John Hughes (he of the Home Alone films), which had gone through the roof at the box-office. 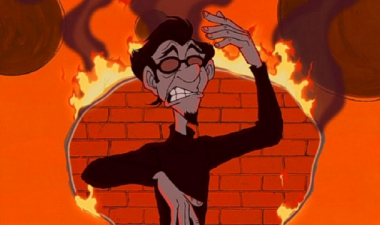 The movie was announced as being the next Disney classic to get the animated sequel treatment. It was all systems go: Dalmatians was about to become a major Disney brand. So what went wrong? Well first the live-action sequel, 102 Dalmatians, which even though was a bigger production and had some delicious designs, failed to gel in the story department and didn’t exactly set the box-office alight. Then the spin-off television series only lasted one season. Merchandise wasn’t flying off the shelves, and suddenly the prospects of another animated Dalmatian movie hitting cinemas didn’t look so rosy. The project was shunted back into development, and destined for video release. In its place came the Peter Pan follow-up Return To Never-Land, which the execs were more excited about, and which turned out to be a charming and well-devised successor to Walt’s original 1953 movie. I was hoping to say that they’d done it again here – and I almost can, though it’s a shame that this only got the video treatment when another outing for a different 60s Disney favorite, The Jungle Book 2, got the full-on theatrical treatment, and for what was an inferior film. 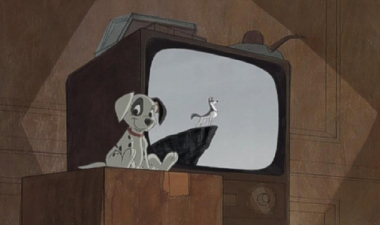 I suppose that one had the bigger voice cast (Haley Joel Osment, Phil Collins, and soon to become “Mr Disney Voice” John Goodman), but Dalmatians II has the better styling and probably more entertainment value. This takes you right back to your childhood, when Pongo and Perdita were almost like your own dogs, and their original adventure seemed very real, or could that be because I lived in London and the locations were right around my corner? 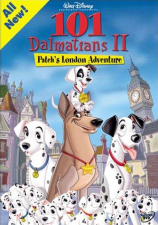 101 Dalmatians II: Patch’s London Adventure is aimed an audience age a little lower than its predecessor, and the story reflects this. It’s a simpler affair, with a cut and dried villain that we all know and love, and the kind of predictable and breezy plot that just about carries it through. There’s not a lot here for adults to get their teeth into, although they can be safe in the knowledge that this is all good clean fun that kids will love, and sure to be another big seller for Disney. What I did find annoying was the voice cast. There seems to have been no attempt whatsoever to mimic the vocals of the characters from the first film (something that Return To Never-Land, and even The Jungle Book 2 got down pat). They’re all in the right ballpark, but fall short from recreating the voices that audiences know and remember from the original. Roger seems too high, Pongo too deep, and Cruella just lacks that evil edge that really did actually make her scary and which even Glenn Close hit on in the live-actioners. Here, she’s more of a comedy figure, playing up to the fact that she’s known for being eccentric and over the top. Jasper and Horace don’t come off too bad, but remain stuck to the sidelines, as do Patch’s parents Pongo and Perdita. As a kids animated movie, this is a cut above the recent influx of Disney animated video sequels, although not quite near the original quality of 101 Dalmatians. The artists have done sterling work in keeping the block-colored styling from the first film in the backgrounds, but the attempt at retaining the pencil look in the characters’ line drawings is somewhat marred by the digital perfection of today’s animation systems. The animation itself sits somewhere between the higher grade of the sequels (Never-Land) and the bottom of the barrel TV quality (Cinderella II). It was mostly carried out under the Character Builders company, although the story and editorial departments were based at Disney Animation in LA. The quality is consistent throughout, and it’s only in shots with multiple puppies in view that repeats are noticeable. There’s a tendency for the amount of little dogs that appear on screen to increase and decrease as the film plays out, although in a production of this type and budget (it’s not a full blown “classic” by any means) it is acceptable. CGI backgrounds, props and vehicles, in particular a double-decker bus, are expertly handled and are colored and shaded to blend in well with the other 2D artwork, which looks to have been completed mainly in Japan. Music wise, I was disappointed that George Bruns’ score from the first film had not been carried over in any way. Part of the success of any sequel is the music, and the feeling that you’re in good company when the strains of a familiar tune pops up. There are snippets of Mel Levin’s songs from 1961, including a tiny bit of Cruella De Vil and a terrible rendition of Dalmatian Plantation, but overall composer Richard Gibbs uses almost nothing of the themes from the original (unlike Joel McNeely’s much more successful score for the Peter Pan sequel). One addition that brought a smile to my face was the chorus of dogs that accompany the famous When You Wish Upon A Star theme on the Disney Pictures logo, setting the audience up for the tone to follow. 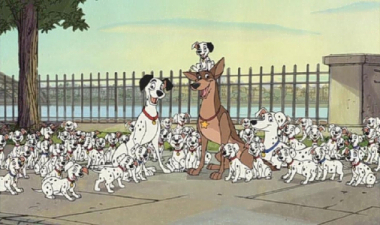 All in all 101 Dalmatians II: Patch’s London Adventure is an undemanding continuation of one of Walt’s more contemporary films. This sequel does have the paradox feeling that, although it is probably technically superior in terms of production (but not animation), it just misses the mark in terms of story and character development. Fans of the original will want to take a look, and may or may not be a little disappointed, but younger kids will get a kick from the returning cast, and there are plenty of “hidden Mickeys” in the artwork for those looking for them! Perhaps it’s not quite top dog in its attempt to duplicate a classic, but it’s not the hound-dog many might be expecting either. While not exactly brimming over with an overabundance of extras, Patch’s London Adventure does offer a handful of fun bonuses. As a side note (and not really an extra at all), the film’s running time is stated on the sleeve at 70 minutes, although I clocked it in at just over 73, so you do get more spots for your buck – and don’t forget to hang around at the end for a little post-credit fun! On spinning the disc for the first time, there’s a selection of trailers for up-coming Disney fare both in theaters and on DVD. Also viewable in the Sneak Peek section, the trailers contained on this disc are for the theatrical release of Piglet’s Big Movie and DVD issues of Inspector Gadget 2, Belle’s Magical World (which looks just as bad as I remember it), Treasure Planet, Atlantis II: Milo’s Return and a first look at The Lion King: Special Edition in an over the top trailer that tries to pack too much in. Next up, and the meatiest of the extras, is a six-minute or so “dog-umentary” on the making of the film. Covering the animation process from the eye view of a bunch of dogs, the featurette takes us to meet the director and voice stars. It’s all been seen before, but the dogs’ perspective makes it a little bit of fun, and kids will lap it up, so to speak. Thunderbolt: An Inside Look takes us into old Thunder’s dressing room. This still framed image allows the visitor to find and click on a variety of Thunderbolt-related clips. 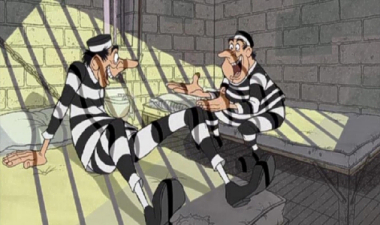 Best of all is the “blooper reel”, which takes existing animation from the main program and re-voices it in the style of the outtakes from the recent slew of Disney/Pixar movies. As with Thunder’s lines in the film though, the scripting isn’t as tight as it could have been and the lines not as funny as they might be. These were the first things I looked at on the disc and I have to say that it put me off the Thunderbolt character until the movie got underway. The outtakes are a little bit of fun though, and other things to be found in the dressing room are simple CGI’d commercials for Thunderbolt-endorsed products, fan mail and signed pictures. Not much, but better than nothing. The Lost In London game is a neat addition and a quick tour around London’s sights. 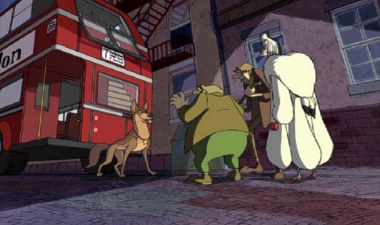 Helping Patch to find his brothers and sisters, the player must select which London landmark they think Cruella has the puppies hidden behind from a three-choice menu. If the correct place is selected, a brief film clip highlighting the location plays, giving kids an interactive tour of the city without leaving their home! Wrapping up the selection are two music videos featuring songs from the film. Try Again is an up-tempo big band number with vocals by Will Young (from the UK’s Pop Idol), while You’re The One, from LMNT (which does not, I’ve been told, stand for Little Mutant Ninja Turtles! ), is a song put to sequences from the movie. A couple of toe-tapping tunes and an extra few minutes of Dalmatian entertainment, both videos add more than a little enjoyment for the target audience. Playing the disc in a DVD-ROM drive offers up the usual Disney interface and a link to register the disc with Disney’s replacement program. Presented in widescreen (though why do Disney make these sequels in widescreen if they believe that family audiences don’t want widescreen? ), the ratio on the cover states a 1.66:1 aspect. In truth this is another title that’s been framed at the more 16:9 friendly ratio of 1.78:1, but either way it looks fantastic. The image overall is exceptionally clean, if a little too bright and lacking contrast – it lacks the depth of the original film. The animation, in trying to capture the original feel, is all too slightly angular and pointed, and the DVD only shows this up even more. Everything is as sharp as sharp can be, and although I didn’t spot any compression artefacts, I did notice a tiny amount of color bleed in some areas of the picture (usually around dog collars). English subtitles are included. The soundtrack here is great for a DTV release. Included is a standard Dolby Digital 5.1 surround mix, although those with even bigger systems will want to default to the DTS track also featured. Becoming more and more a staple of direct-to-video releases, they are always a welcome addition, though unfortunately still a spotty option when talking about Disney DVDs. The DTS does have a slight edge, but as usual it’s a small volume change that can be approximated by turning up the bass a little on the Dolby track. Also included is a French-dubbed track that sounds the same as the Dolby surround. 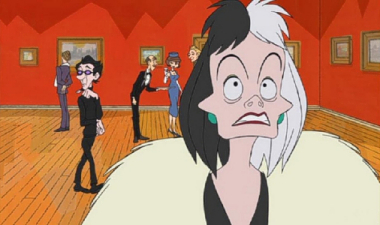 With the original 101 Dalmatians classic not due to make another appearance on DVD for a few years (when the deluxe Platinum Edition has been rumoured for release), this is your chance to reacquaint yourselves with Cruella and the gang. Much better than some of the sequels that have appeared from the Mouse House in the past, this one rates along side Scamp’s Adventure and Simba’s Pride in terms of animation and ambition. Story wise, there is an attempt to tell one story over the length of the entire movie, so this isn’t an episodic compilation of the animated TV show, and it is presented on the disc as if it had been a theatrical feature. Original book author Dodie Smith did write a sequel, The Starlight Barking, but those (often whimsical) elements have not been touched on here, and while Patch’s London Adventure doesn’t have the depth in the plot, or the image, of the original film, the Thunderbolt TV sequence is huge fun, and the showdown bus chase is an exciting thrill ride. What’s next though: 103 Dalmatians?